Yep, this was an exercise done to find out what is out there in the market already and to look at what the trends and gaps in the market are. I only really went to two shops this time, since the only other toy shop has so little stock and is in a different part of town. I was more interested in all the dolls currently selling so stuck to the main, larger, shop. I had a look at Danka_Zee’s posts and saw the vast array of ‘black’ dolls produced by Mattel and a few other companies. Sarah was right to point out that the comp shop was focused on the UK and not on other countries. I can’t answer for the American market, just for the UK one. In the UK we don’t have the selection that is offered in the USA. Here, you are hard pressed to find any doll apart from the light skinned, blonde, blue eyed doll unless you are shopping in a specialist collectors shop, which the comp shop wasn’t focused on. Even then the dolls of other ethnic groups are rare. In the UK there is a need for cultural dolls from other ethnicities, If Mattel have so many dolls available, they are certainly not offering them to the UK market, this I confirmed with the owner of a local doll collectors shop, which is difficult to comprehend. Dolls such as Monsters High and Ever After High are not very popular or collected here, where Bratz sells equal if not slightly better than Barbie. I stand by my thoughts on the need for multi-cultural dolls, especially in the UK where we have such a wide variety of cultures on such a small island. I have a friend who only makes African dolls, she cannot make and sell them fast enough, which tells me there is a need for them, I also have several custom orders for dolls that have darker skin to match the clients own skin tone. I found it interesting when running a doll making workshop with children, I asked the children (all light skintoned) to choose the fabric for the dolls body, each child chose a darker colour. Although I have never seen Danka’s posts before I have read several from women of African American heritage and all the blogs I’ve read talk about a lack of dolls representing them. Some pointed out it wasn’t as simple as making the same doll with darker skin, but making the hair more representative to their culture. I also stand by my thoughts on selling stand alone outfits, separate clothing for 11″ dolls has only recently returned, but the variety is minuscule. I also have to question why there is such a high amount of naked, unwanted dolls in charity shops? Surely if the child didn’t desire more clothing over another doll then these leftovers would be clothed or not unwanted. Doll companies make much more money convincing us to buy the expensive doll with new outfit (No, dolls are not always cheap here) than to sell us a cheaper outfit alone. This was a competitor shop report. Therefore Joy was looking only at stock within shops local to her. The post was not about her choosing US made dolls over British. She started out saying it was based on toy stores near to her in Leeds, only. You wrote an interesting article, but a little misinformed. 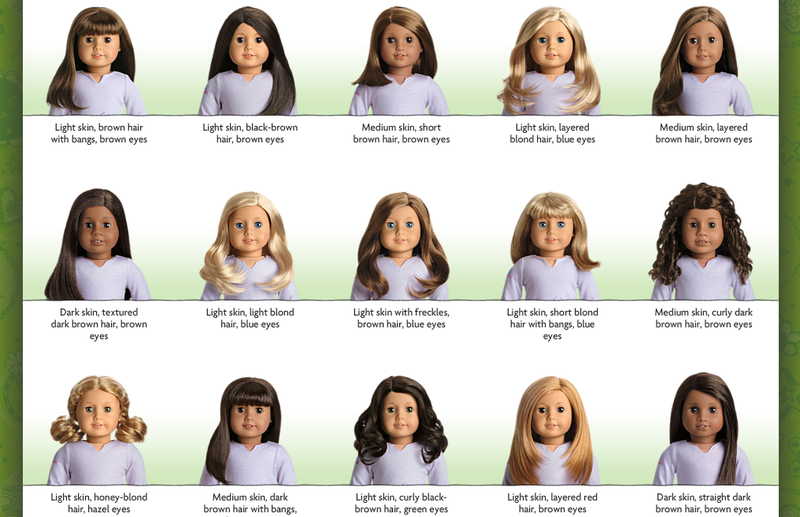 All the dolls you have mentioned are produced by the US companies, and all of them create multiracial dolls. There might not be enough of them, but as you see it was the store that chose to order only the dolls you had presented. Monster High and Ever After dolls have been highly collectible in the US and these dolls are just monsters, not people. They are pink, green, blue, brown. I don’t collect them so I don’t know how many different dolls were there. Pooping Moxie is a stupid idea, I agree with you, and in the US they are almost out. You barely can see them in the stores. Bratz were very popular among pre-teen girls and they had they outfits and accessories, the company just happened to be too successful and Mattel didn’t like it. Spent years in courts, and trying to come back again. Our Generation is not bad, and I do see darker skin dolls, but you are right, not enough ethnic dolls. The news is they really don’t sell well. I wrote couple articles about black dolls on my blog, if you choose to read them. And last, children in the USA really waste their toys. The dolls here are very cheap so children do not value them. Barbie dolls do have different outfits here, but people barely buy them. I don’t think the manufacturers are responsible for lack of certain items. If there is a market for something they will produce it, hence pooping pets. And Disney? Walt Disney has been dead for a long time, so there is only a corporation left – money, and only money counts. very interesting I found it very difficult to find a doll for a mixed race little girl who was seriously ill in hospital so I made one out of felt as iI could adjust the skin tone. Similarly I have just made a redheaded angel for a friends daughter. More diversity is needed. Sasha dolls on the 70’s made dolls with different skin toones but we don’t seem have moved forward at all.